With the winter months well and truly gone and the long summer evenings on the way in, it's time again to start modifying in preparation for the season, which lies ahead. 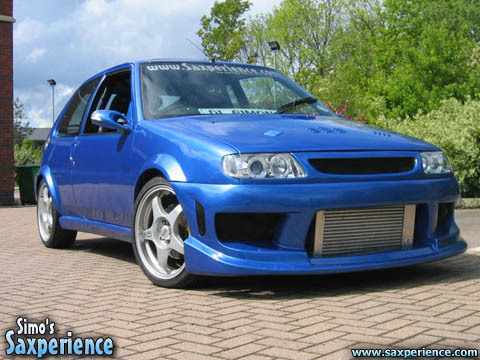 I often think that the front of my car looks a little strange... sometimes I dont like the full-face intercooler look? 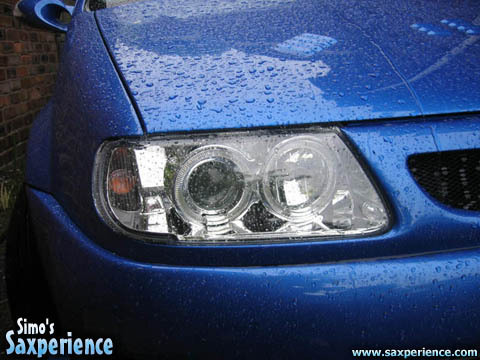 In an attempt to try something fresh, I bought a pair of Ultra Angel Eye headlamps from G.S Motorsport. These are actually quite a good bit of kit and are supplied with ample fitting instructions. The light units themselves seem like very good quality. The French Car Show was to be held right at the end of May and approximately fifty cars were due to make an appearance on the Saxperience show stand! The day before the show, my new seats and harnesses arrived, so it was a bit of a rush job to fit them! 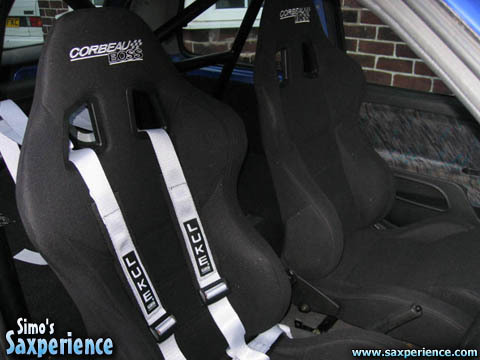 I chose some Corbeau Boss reclining bucket seats and a set of silver Luke 4-point harnesses. The seats really are comfortable! 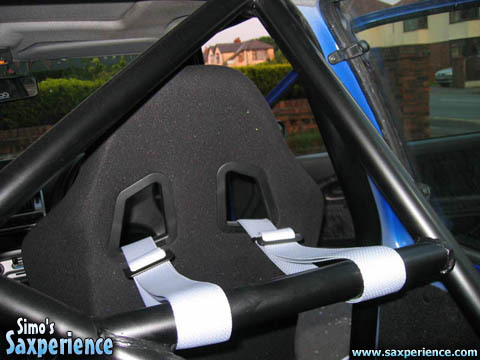 I'd decided to opt for the 4-point harnesses as I wanted to attach the straps around the roll-cage cross bars, rather than mount them to the floor in the rear. The colour of the harnesses sounds a little odd, being silver, but I think they match the interior of the car quite well... with the silver Atomic subs and the silver colour coding around the dash. With both the interior and exterior freshened up a little, I now need to decide on my future plans for the car. Nothing is certain at this stage, but I could do with re-designing some of the engine conversion and on the inside, the door cards could do with re-trimming. Maybe a new set of alloys?? Who knows.... Make sure you check back soon, to see what, if anything, I've done to my car next.